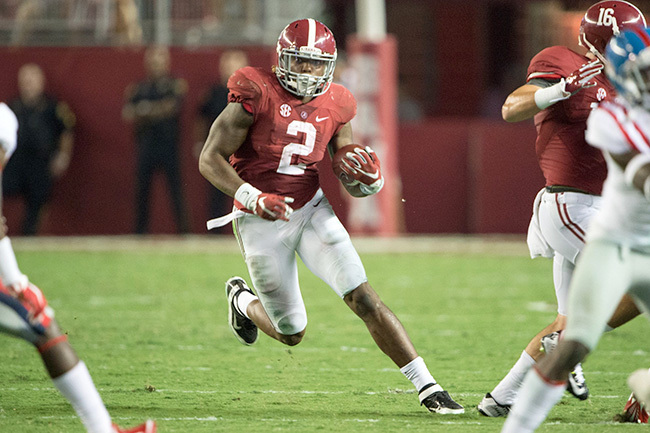 Derrick Henry joins Marcus Mariota in a Heisman backfield in Tennesee. The Heisman winner ran rampant through college defenses this season, an unusually big back who handled an unusually large workload. Does the Alabama star have the skills to succeed in the NFL? NEW YORK CITY— Derrick Henry’s voice was barely audible over the din of the crowded hotel. 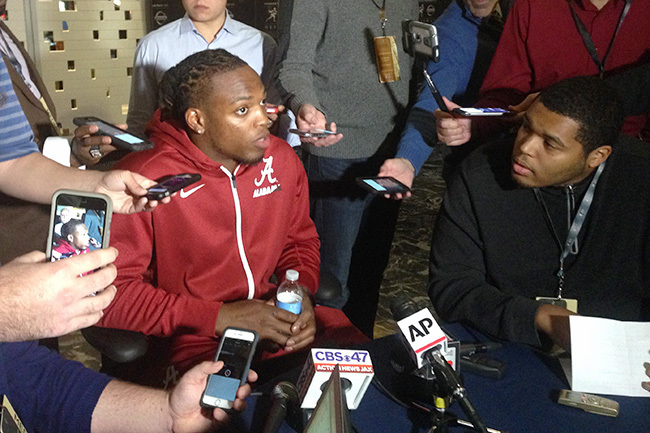 Reporters circled close around the Alabama running back, straining to hear his answers. For the majority of the time the junior from the University of Alabama dutifully answered questions on the eve of the Heisman Trophy ceremony. Except for two: What will it be like to add the Heisman to his trophy case with the Maxwell and Doak Walker awards? (I’m happy to be here, taking it a day at a time.) And: Is the NFL up next for you? I’ve still got a college season, I’m not really worried about that right now. 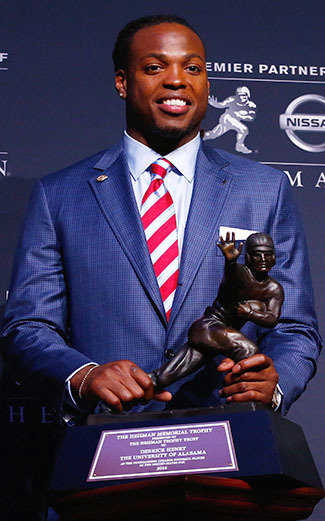 He was handed the Heisman one night later, a reward for a season in which he broke Herschel Walker’s 34-year-old SEC single-season rushing record. The 6-3, 245-pound junior is too much for college defenses to handle; while he might not want to talk about it, the NFL is the natural next step. Now, talent evaluators have a question to answer: How will Henry’s talents translate to the next level? Nick Saban’s Crimson Tide offenses are known for power running tandems. Glen Coffee and Mark Ingram (2008), Ingram and Trent Richardson (’10), Richardson and Eddie Lacy (’11), Lacy and T.J. Yeldon (’12), Yeldon and Henry (’14). Each time the top back moves on to the NFL, his counterpart rises to take his place, the pattern repeating itself. Henry’s record-setting year earned him college football’s highest honor. This fall the tandem was supposed to be Henry and Kenyan Drake, but injuries to Drake put an enormous workload on Henry’s broad shoulders. His 339 carries are unheard of for a Saban back. Henry’s high volume of carries is part of what makes him such a compelling prospect. If Alabama makes it to the national title game Henry could reach 400 touches this season, a mark only six FBS backs have reached since 2000. With 1,986 rushing yards, he’ll almost certainly pass 2,000 in the Cotton Bowl. “He did as much for his team as anybody could have done or ever has done for any of our teams,” Saban says. • JARED GOFF PROJECTS TO STARDOM: Film maven Andy Benoit breaks down the Cal quarterback, who could be the top pick of the 2016 draft. Henry has proven himself to be durable, but NFL teams may be concerned with that workload. As the analogy goes, a back can only go so many miles before he breaks down, and Henry has accrued a lot of those miles in Tuscaloosa. However, he hadn’t been worked particularly hard on a per-game basis until the second half of this season (200 rushing yards in four of his last six SEC games, with 210 carries in those contests, including 90 between the Iron Bowl and SEC title game). And Henry has worn down opponents more than they’ve worn down him. He is averaging 5.8 yards on his first 30 carries of a game, and 6.5 yards after that. Henry is a load coming through the hole. Among current NFL starting running backs, only 11 are listed at 6-1 or taller, and only two are 6-2 or taller. Oakland’s Latavius Murray is also 6-3, though Henry has 15 or 20 pounds on him. Savage says Henry reminds him of a better version of Brandon Jacobs, the 6-4, 260-pound former Giants back. “Derrick has more ability than Jacobs, but he has that same sort of style,” Savage says. Henry’s long legs provide a bigger target to take out low, but he uses his mass to break tackles, punish tacklers and wear down defenses. Opponents often bring eight-man fronts against Henry, yet his gaudy numbers are fueled by a phenomenal 105.3 yards after contact per game, according to Alabama. Henry lists George and Eric Dickerson (also 6-3) among former NFL backs that inspire him. Like those two legends, Henry combines his size with subtle quickness and speed. He’s a long-striding runner who needs two or three steps to get started, but once he breaks into the second level he’s difficult to bring down and can outrun pursuit angles. He got plenty of questions about his NFL future, but Henry kept the focus on Alabama’s playoff run. The biggest knock against Henry is that he can’t be used as a pass-catching back. He only has 10 catches this season and just 16 for his career. When it comes to the passing game, Alabama hasn’t utilized him, choosing to diversify the offense instead. NFL teams prioritize versatility, so to improve his draft status Henry will need to show that he can be a three-down player. As for possible fits, Savage points to a team he’s familiar with: “Baltimore could use a big burly back in the AFC North in that weather to help take some pressure off of Joe Flacco.” Savage was the Ravens’ director of college scouting for seven seasons and director of player personnel for two years. Another possible landing spot for Henry might be Chicago, if the Bears don’t re-sign impending free agent Matt Forte. A friend of Saban’s, Bill Belichick, could make Henry an upgrade over free agent LeGarrette Blount as the big back in New England’s two-back system. The last Alabama back drafted in the first round turned out to be a bust. Trent Richardson is a punch line after the Browns took him with No. 3 overall in 2012 and the Colts burned a first-round pick to acquire him from Cleveland. Perhaps teams considering Henry in the first round will think twice, but his draft-weekend wait won’t be a long one. And the team that drafts him will be expecting very big things.